Sharing a love of yoga, art and fashion, Carmena Su and James Wvinner founded Yoga, Tribe and Culture in 2004. Their dream was to create a line of clothing and media products that was hip and authentic while using consciously sourced materials. Yoga, Tribe and Culture arose out of living in this day and age – to make sense of our identity consciously (or not) by the way we dress, what and who we listen to and where we devote our energy. Yoga means Union – it is a worldwide spiritual and physical practice but you don’t have to have a yoga mat or go to a yoga class to practice yoga. Skaters, surfers, dancers, knitters, musicians, couch potatoes can all be great yogis. Our goal at Yoga, Tribe and Culture is to speak to the urban yogi, combining ancient yogic concepts and intentions with a strong, modern, bold design. Ideally a yogi is someone who is engaged with the world and who dedicates their practice to the betterment of others. With that in mind, Yoga, Tribe and Culture is committed to supporting different causes by creating limited edition designs, the portion of sales from these designs goes directly to these hardworking organizations. This tank is so adorable! I'm wearing it now, the hot weather has been so bad lately so this is perfect! For the true teacher is inside all of us this 'Self is Guru' T is perfect. Made with 98% Organic Pima Cotton, 2% Lycra. The scooped neck, soft handle and longer in the body makes for a flattering fit for everyone. Also available as a crew-necked T.
Once again, super soft and high quality! 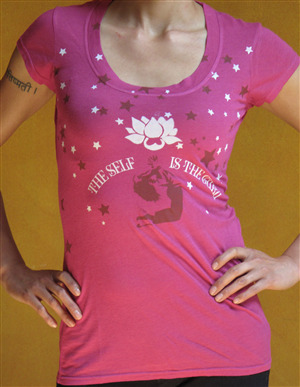 I love the concept "self is the guru"- so true! I'll be sportin' this everywhere! Our long, lean, lusciously soft pants skim the body for a flattering fit. With detailed stitching for added flair, they’re sure to become a favorite! Okay, these are by far the sexiest yoga pants I've ever worn. Don't be fooled, they are still extremely comfortable. However, they have a sultry flare to them that I haven't found in any other yoga pant yet. Unique, super comfortable and stylish hoodie made for wearing over your yoga clothes, or with heels and a pair of jeans. Long in the body with a large hood with graffitti inspired artwork on the back and sleeves. On the right hand sleeve is the Kundalini mantra 'Ong So Hung' which means 'What I Am To Be I Already Am'. Made from 95% Organic Pima Cotton Fleece with 5% Lycra. Ahhh! This is A MUST HAVE HOODIE for fall! First of all, it's really long and very comfortable. You can see I am wearing the Helena Bootleg pants with it- I wore this outfit bowling. That's what I absolutely LOVE about YTC Clothing; they aren't just yoga clothes, they are street clothes too. I wear it everywhere! I also love that saying "Ong So Hung"- meaning "What I am to be I already am." Yay!!! You can get a 15% discount if you sign up to be a Tribe Member HERE!!! Very cute tops! And I love the Hoodie!! LOL! Yoga pants are a must! But I just us a baggy tee for my top! LOL!